The idea of the Indian and buffalo on the same coin is, without doubt, purely American and seems to be singularly appropriate to have on one of our national coins. Fraser's lobbying paid off, as he was selected as the designer of the new nickel. Fraser depicted a Native American on the obverse, sitting three different Indian chiefs as models to form a composite portrait. In keeping with the western theme, an American bison, more commonly called a buffalo, was selected as the main reverse feature. The bison was modeled after a resident of the New York Zoo named "Black Diamond". The Buffalo Nickel was released on Mar 4, 1913, the last day in office for President Howard Taft, who received a bag of the new coins at a groundbreaking ceremony for a Native American center in New York. There were two varieties of the Buffalo Nickel in 1913. Type 1 nickels were minted for only a few months in 1913, characterized by the wording FIVE CENTS on a raised mound on the reverse, as shown in the photo directly below. This was quickly recognized as a rapid wear spot, so the mound was reduced to a straight line. The area below the line was recessed, where FIVE CENTS received greater protection against wear. The straight line resulted in Type 2 Buffalo Nickels. US Coin Values Advisor has completed Coin Value Tables for the Buffalo Nickel, reporting price trends over a long period of time for individual coins of this series. 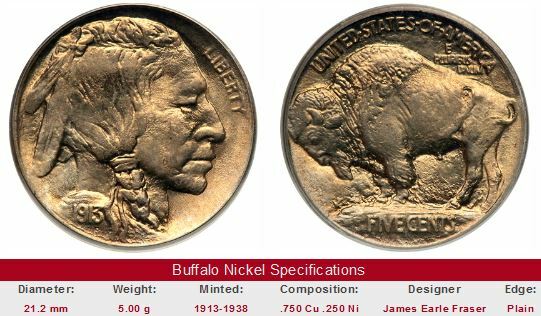 After debuting in 1913, minting of the Buffalo Nickel continued intermittently until 1938. None were made in 1922, 1932, and 1933. By the end of 1937, plans were in full motion to replace the Buffalo Nickel. The last of them were minted in 1938. These are clay models of the Buffalo Nickel sculpted by James Earle Fraser. The model on the obverse was actually a composite of three Indian chiefs named Iron Tail, Big Tree and Two Moons. The bison model, named "Black Diamond", lived in the New York Bronx Zoo, and steadfastly refused to cooperate with Fraser. The artist convinced a zoo keeper to distract the massive animal in order to capture the side profile he was after. Buffalo Nickels are very popular with modern day collectors. A number of well researched books are available to assist numismatists in their quest for knowledge about this quintessential American coin. As always, when you buy rare coins on eBay, make sure they've been certified as authentic by one of the four leading grading service companies: PCGS, NGC, ICG, or ANACS. This is especially true for the 1937 Three-legged Buffalo Nickel, as many fakes of the rarity exist. The left hand side of each "Sales Box" is value trend data over a very long period of time for a coin of that date in G-4 condition. The percent annual increase is computed for comparative purposes. The coin pictured for sale in the right hand side is not necessarily the same condition coin as that represented in the value trend analysis on left hand side.